The National Enterprise Architecture website is the main source of IT-related standards, guidelines and best practices for Bahrain government entities across multiple areas, including eservices, mobile applications, websites and technologies. 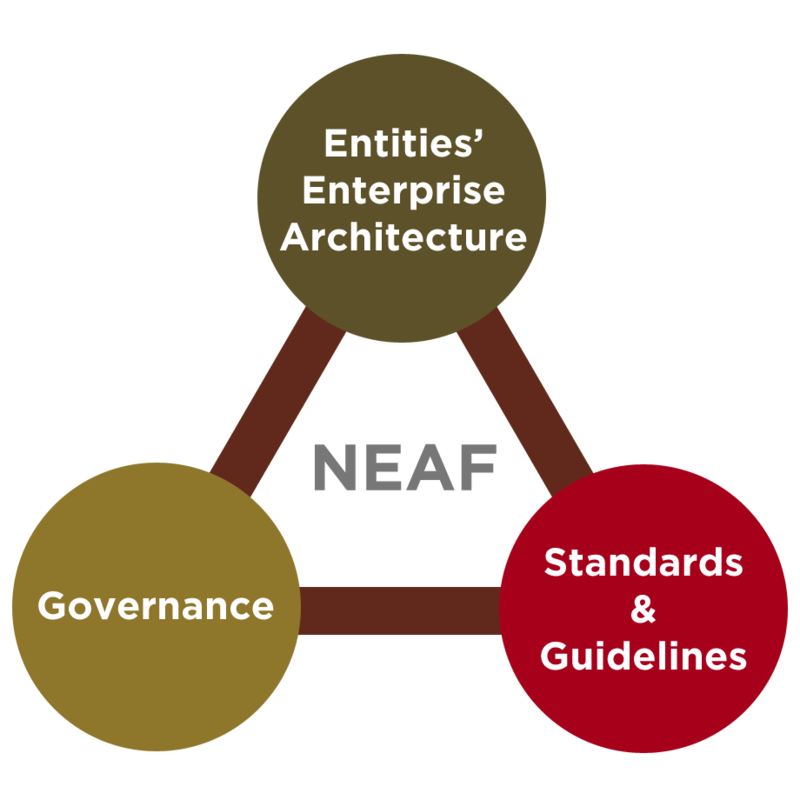 The website also focuses on the National Enterprise Architecture Framework (NEAF) and provides details on its Enterprise Architecture (EA) Maturity Model, along with a set of templates and references to help government entities to implement and customize their EA based on their environment and needs. This section provides an overview of Enterprise Architecture (EA) along with its key benefits. A set of Technology Standards and Guidelines for increased interoperability and integration across kingdom's organizations. All queries regarding EA are welcome. The National EA Team will assist you. The objective of Website Standards is to introduce a level of consistency throughout all Government websites in terms of positioning and functionality of key website elements and to promote the Government identity of the Kingdom, therefore making it easier for users to identify Bahrain government entities’ websites. Additionally, a potential advantage will be achieved which is to ensure reduced development and website maintenance costs. Moreover, a variety of web validation tools are available for ministries to assist in developing defect-free and high quality websites. eServices Standards are language-specific programming rules that greatly reduce the probability of introducing errors during the service development life cycle. These standards are originated from the intensive study of industry experts who analyzed how bugs were generated when code was written and correlated these bugs to specific coding practices. This section includes CSS guidelines, Java standards, User Interface standards, C# .NET coding standards, and Java/J2EE naming conventions. The National Information and Communication Technology eGovernance Committee (ICTGC) held its first meeting following the reformation of the committee, chaired by Information & eGovernment Authority (iGA) Chief Executive Mr. Mohammed Ali AlQaed. The National Information and Communication Technology of eGovernance Committee (ICTGC) has praised the collaborative efforts exerted by ministerial and governmental entities during 2014. The notable achievements of the committee are the Enterprise Architecture Maturity Program and the Strategic IT Planning, which resulted in standardizing technologies and IT strategy development methodology across governmental entities, as well as major reduction of duplicated government processes. The Website Standards and Guidelines have been updated, aiming to ensure a high degree of consistency and uniformity of government websites. The updated version includes clear methods on new domains such as Web Accessibility in order to provide equal access and equal opportunity to people with disabilities. The updated version also includes Web Optimization Guidelines to improve the performance of government websites, which is directly translated into better user experience, repeated site visits and improved customer satisfaction. During the 11th meeting of the ICT Governance Committee (ICTGC), the committee has approved an updated version of Technology Standards and Guidelines - aiming to have a unified set of standards that are aligned with the current usage across the government entities and the latest technology trends, while supporting the National eGovernment Strategy 2016. The updated version includes new domains such as Business, Mobile and Social Media, as well as various revamps in the existing domains.